Incredible offer, truly a one-of-a-kind home and property! FAMILY LUXURY LIVING at it's very BEST! Amazing Luxury Family Home has it all! One of the finest hand crafted luxury homes you'll ever find, this is a MUST SEE home with tons of room for any sized family. 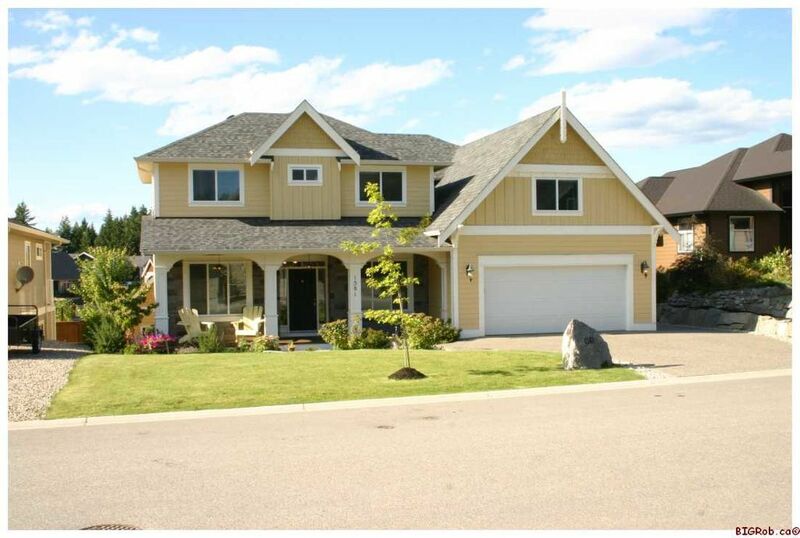 Local builder owned & occupied this 2 Storey with Walkout basement offers 4500 SqFt on 3 levels. Covered Porch, Foyer, Main Floor Den with Double Glass French Doors, Luxury Living Rm with Gas Fireplace, Eat-in Gourmet Kitchen with Granite/Quartz counters, SS Appliances, Gas Cooktop, Formal Dining Room with Butlers Pantry, Tons of finished carpentry including hand routered wood ceilings, Family Mud Room, U-shaped staircase, Glass rail deck with power sunshade awning. 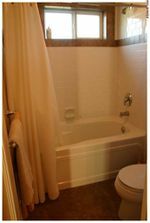 Upstairs offers Large Master with Spa-Like 5 Piece Ensuite that includes 2 sinks, soaker tub & Body Spray Eruopean Shower; 3 Full Bedrooms with 2 Full Bathrooms including Brady Bunch Bathroom between 2 Bedrooms, Large Bonus Room, Laundry Room & Study area in open hallway. Lower Floor offers full Theatre Room w/Dolby 7.1 Sound, Huge Games Room, Family Room with Gas Fireplace, 5th Bedroom, Full Bathroom, Large Storage Room. Pool, Trampoline, Playhouse, Shed, Fully fenced backyard, Garden, Landscaped 1/4 Acre Lot, RV Parking. Walk to Schools. 1. CLICK HERE For Our EXTERIOR SLIDE SHOW Presentation! 2. CLICK HERE For Our INTERIOR SLIDE SHOW Presentation! This 3 year old builders personal residence was built with FAMILY in mind, offering 5 Bedrooms with a Bonus Room that could be a 6th Bedroom, there is sufficient space here for any size family. Located in the central sub-division of Lakeview Meadows this quiet residential area allows your children and teenagers to walk to schools! This particular 1/4 Acre lot is one of the largest lots in the sub-division too, providing the maximum size for your full enjoyment. Included in the sale are an above ground swimming pool, trampoline, 2 storey fully wired childrens playhouse, large lawns, fully fences backyard. There is also a fully wired tool/garden shed and a garden area. The lot is fully landscaped including underground sprinklers and the exposed aggregate concrete driveway also has an RV parking spot for your boat or trailer. Truly a 'Hand Crafted' Home which is evident from every aspect, this builder hand builds one house per year and does all the finishing work himself; you won't find another hand crafted home like it anywhere! A two storey design with a fully finished walk-out basement provides for three levels of lifestyle. Approx 1300 Sqft on the Main Floor, 1600 SqFt Upstairs and 1600 SqFt downstairs. The main floor offers a Living Room with gas fireplace and custom hand built 9 Ft wood ceilings; A formal Dining Room with a Butler's Pantry and wood wainescot walls. There is a large entrance foyer with access to the main floor den with double glass french doors, tray couffered wood ceilings and wainescot walls. The Chef's Gourmet Kitchen has a large Bakers Island with granite countertop and there's a gas cooktop grille, stainless steel fridge with french doors and auto ice maker with door dispenser, built-in wall oven and microwave, dishwasher and Miele steam cooker. The sink counter is made of Black Caesar Stone Quartz to compliment the granite island. There is also a built-in telephone desk wired for your Kitchen PC to look up your favorite recipes. 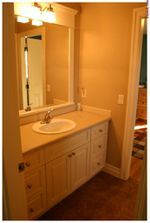 Also on the main floor is a well appointed powder room and a full mud room with built-in shelves and hooks and a utility sink for easy wash up right off the garage. You'll love the open deck that comes with glass railings and sierra stone topping right off the Eat-in kitchen area. There's a gas BBQ outlet and a fully retractable power awning with a remote control operation that allows you to utilize the deck even on the hottest days or during inclement weather. Wired with outdoor speakers so you can set the mood. Easy rear yard access with a full set of stairs going out into the backyard too. Upstairs you'll find 4 full bedrooms and 3 full bathrooms along with a laundry room and bonus room above the garage. 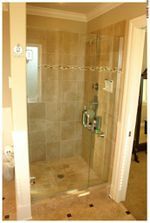 The Master Suite includes a private "spa-like" 5 piece ensuite that includes a soaker tub and walk-in European tiled shower with body spray plumbing fixtures. There's double sinks, heated tiled floors, all decorated to enhance the soothing atmosphere you'll enjoy soaking away in the tub! The Master also offers a full walk-in closet. Bedroom No. 2 and 3 enjoy their own 'Brady Bunch' style full bathroom that offers an open vanity sink area with a private shower, water closet area. Perfect for the kids early morning bustle of preparing for their day. Bedroom No. 4 is just steps away from the 3rd upper floor full bathroom too! You'll also find a large bonus room above the garage that could easily be a 6th bedroom in the home. The lower walk-out level has the 5th Bedroom and another full bathroom. You'll also find a full games room, family room with gas fireplace, both with hand crafted custom couffered tray ceilings too! Below the garage is a sound proof Theatre/ Media Room with Dolby 7.1 Sound Surround System. 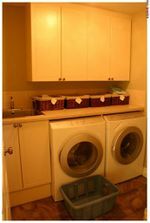 There is also a large storage room off the utility room area. The home is heated and cooled with a heat pump forced air system that includes a top of the line electronic air filtering system. There is also a built-in wireless network and speaker system throughout the home. Truly a home you can be proud to own, Call Rob today for your personal viewing appointment! Thank-you!